Sometimes you have to get out refreshing yourself. Leave everyday life with its small and bigger problems behind and go elsewhere get some fresh air. Sure, you could easily have a family sitting in front of your family tent. Following are some tips to have wonderful camping vacation with your children. When you think about setting a vacation, you may try to find somewhere to book your holiday or a hotel room, or enjoy the all-inclusive service of a large resort. But how about having a holiday in the middle of the great outdoors in a tent? Early breakfast in the first rays of sunshine outside the tent, spend time in nature and in the evening around the campfire to end the day with guitar sounds, and sausages. Anyone who has been isolated knows how easy such a trip can run and how well the children in the “summer vacation” feel. If you have not ever had a camping vacation before, you must have had a lot of question in your mind: Can the kids in the tent get too cold? How old are the kids should go camping with the family? What equipment do you need? What are the hygienic conditions at a campsite? And is it too messy? You only have a chaotic tent holiday if you approach the whole thing unplanned. With a little planning, good equipment and one or another insider tip makes Camping is fun and all family members can enjoy relaxing holidays. But what do we need to do now? Very important: best family tents for camping . A good tent is a prerequisite for a relaxing holiday. It should not be too small, because in addition to the respective number of persons also luggage and household utensils have to be accommodated. A 4-person tent is therefore too small for a family of 4. Because families with children mostly arrive by car, therefore the pack size of the tent is not quite as important as a tour by bike. Each holiday wishes a good weather – but the suitable tent must be particularly resistant to rain. Since there is no guarantee, so you should take care when buying a tent based on the water column. Usually a tent from 1500 mm water column is considered waterproof. In addition to a suitable tent, sleeping pads , air mattresses and sleeping bags are needed. It is worthwhile to invest a little more money for sleeping; because nothing is more unpleasant than freeze at night in the tent. Tip: prefer to buy a warmer sleeping bag. If it is too warm at night, so the zipper can be opened and the sleeping bag can be used as ceiling. Experienced campers also prepare jogging suit and some shirts even in summer. It may be pretty cool at night sometimes and an extra layer of clothing is then perceived as pleasant. When children have opportunities to play outdoors, hence the appetite is often particularly high. A small gas stove therefore necessarily belongs to the basic equipment of every camper. It is easy to use and can save space when not in use. These two pots, cutlery and crockery (best plastic), camping chairs and folding table are practical companion for tents – in fact if you do not have chair and table, your family can have meal just simply on a blanket on the ground. Whining children at tents are really the exception. But holiday with a baby is not a problem. Many campsites are now able to come up with modern sanitary facilities, so that for reasons of hygiene, there is able to camp with very young children. Of course, the environment is an alien – but the parents as the main caregivers are indeed there and with the favorite cuddly toy in their luggage. 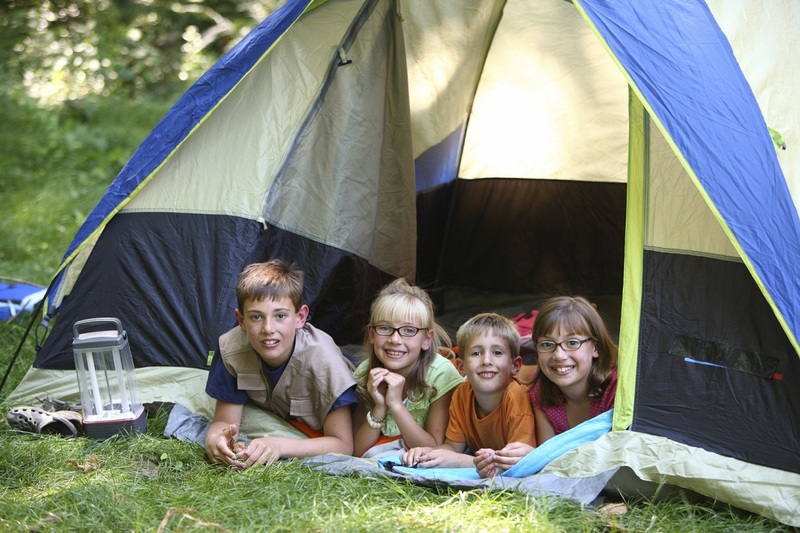 Camping outfitters offer even small “cots” in which the children can travelers a cozy, confined space in the tent. So now, be ready for a wonderful camping trip with your children and enjoy the most interesting ahead.